find any patents pertaining to the design. doesn't claim it is new. I started to reply to this yesterday but it led me down a research rathole and I never finished it. There are a bunch of names that can be added to the above list; the part that slowed me down was verifying which double-arbor saws have side-by-side blades, and which have collinear blades and a single blade opening. The latter type of saw was, so far as I know, invented by C. P. S. Wardwell. The history of Wardwell's saw is pretty complicated because it was briefly made by Wardwell himself, then by L. D. Fay, Rollstone Machine Works and James Goodrich & Co. Then Wardwell resumed production. Putnam Machine Co. made a version, and so did C. H. Cowdrey. There was a bit of a patent war going on, as various people made changes to Wardwell's design to avoid his patents. It would take some serious research to figure out who was licensing whose designs. 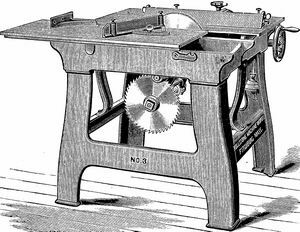 I just did a patent search for saws of this type, and Wardwell's patent does seem to be the first. The second such patent was to Salmon Putnam, assigned to Putnam Machine Co., for an improvement to Wardwell's patent. The third patent was to one Hiram Thompson, assigned to R. Ball & Co., for a saw similar in concept but different in design to Wardwell's. 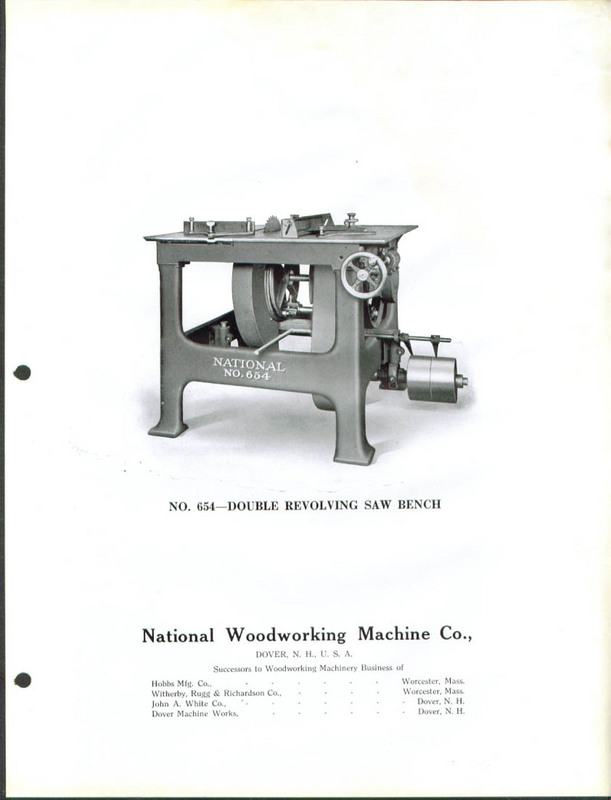 The generic name that was used for these type of saws was "Universal Saw Bench", at least in the early 1900's. I see "American" and "Yates American" mentioned. "American"could mean "American Wood Working Machinery Company", which became part of "Yates American" or it could mean "American Machinery Company" which became Oliver. AWWMC had a Universal Saw Bench but it was actually a "FH Clement" machine before "FH Clement" became part of AWWMC. 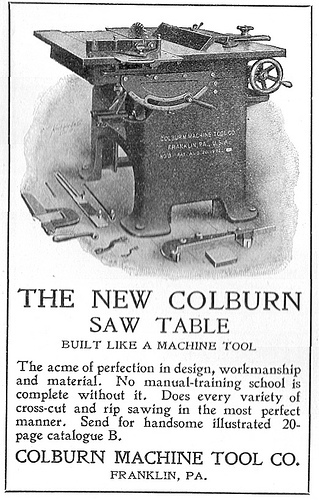 Matt *da torch* Prusik left a 1905 magazine in my mailbox a few weeks ago and one of the items I saw advertised in there was the Colburn saw. I've sent a scan to Jeff Joslin for entry into the Mfg'er index (as opposed to the MF'ers Index) since there were none posted previously. 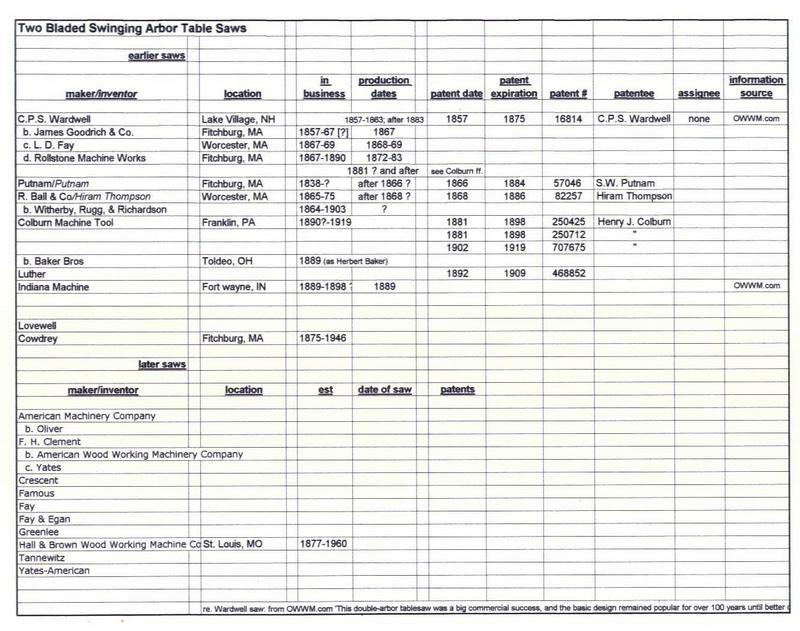 A quick look at the Clement/AWWM Co./Yates catalogs indicates that they were pretty late in coming to the USB. The first edition of the AWWM Co. catalog does not have a USB in it and only shows a Clement double arbor saw in which the arbors are not in the same plane. It has two side by side saws separated by about 4 inches. 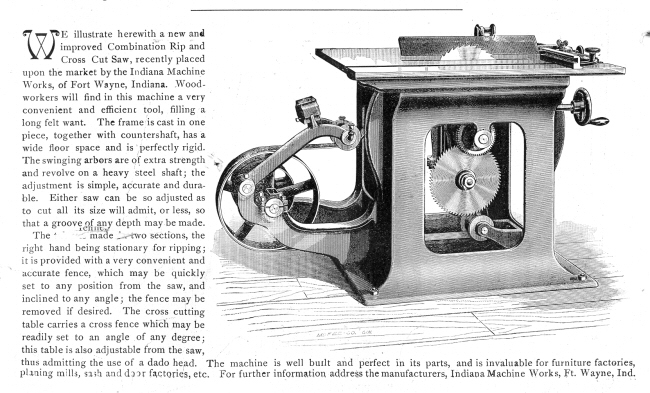 Edition 4 (undated but post 1901) is the first I have that shows the "Clement Patent Universal Saw Bench". I can find no mention of a USB in any of the Berlin/P.B. Yates literature. I suspect Yates never made a USB as their market was more heavy milling oriented. After the 1925 merger forming Yates American they offered the same Clement USB made by AWWM Co. before the merger. Later (I don't have a date but suspect mid 1930's) they came out with the model 91 tilting arbor USB. Jeff McVey or Chuck Hess would know more but the American/Oliver USB came out no earlier than around 1903/4. 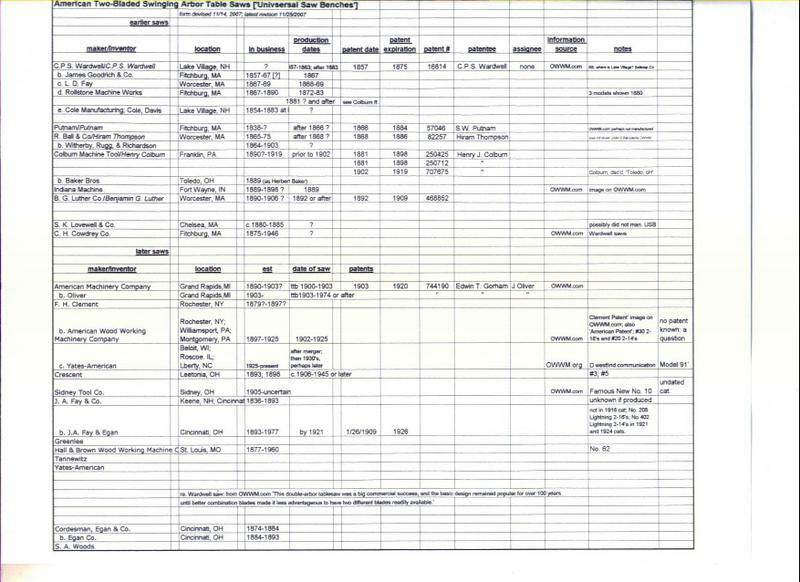 Here is an example from National Woodworking Machinery. This Co. succeeded Witherby et. al.